The little black dress, the immortal must-have piece in your wardrobe. We've decided to do our version by treading a fine line between classic elegance and modern sensibility, using unique geometric cutting such as an elongated armhole, a beautiful drop back, and yes, pockets. Graceful and effortless with a touch of flair, this is the perfectly versatile dress. Throw on a jacket for a classy office look, or put on a nice necklace for a playful cocktail look. Our Spring/Summer 2014 online store is now official open, with limited quantities so check it out whilst it's available! To commemorate this special occasion, we've partnered up with the amazing talents of Marc.Two Visuals for a promo video! More to come about the video, but here's where you can take a quick look at it! It's February! Meaning it's probably maybe officially spring? Meaning we may have some spring-related news very soon. Stay tuned! A short while ago, we partnered with VeryHK for a street fashion show held at Moon Street in Wanchai. It was a great opportunity for us to exhibit the collection live for the first time, and are so thankful for all who are involved. Here's a short video that our friend Warren Ng put together of the show, so if you missed out on being there that day, check out some of the footage! Life of a designer is sometimes severely imbalanced. Currently I'm in the process of designing our second collection, and whilst normally these times call for a period of isolation, it seldom happens that way. Like this time, the brilliantly talented folks from Marc.Two Visuals came up to me with an idea to shoot a fashion short film, well who says no to that? So amidst being in isolation mode, this is absolutely worth taking a day out of my personal cave to participate in. I just wanted to personally, and on behalf of Berayah (whatever this means) thank the friends of Marc Two, Susanna, Jean-Baptiste and Polina for making this happen. Love the fact that creative people can get together and drum up something beautiful, and I cannot wait to see the end result of this film. Will keep all of you posted! As if life forces us to stop when we face intersections. Take a deep breath, enjoy the passing of time, take stock of the beautiful things in life. You need this. I first came across the work of Miriam Böhm from attending Art Basel several months ago. What struck first was the beautiful geometric composition, how clean shapes and lines compose each rectangular frame. Then I paid attention to the juxtaposition between 2D and 3D objects, one intertwining and overlaying upon another, creating an immense depth to each piece. The most interesting part is the engagement of the mind, how one is invited to peel off layer by layer, almost figuring out the artist's construction in reverse. Love how at any moment you're deciphering whether something is or was 3-Dimensional at what point, and how something in 2-Dimension can have more depth than it's length and width. Check out more of Miriam Böhm's work at the Wentrup Gallery site. It's official. 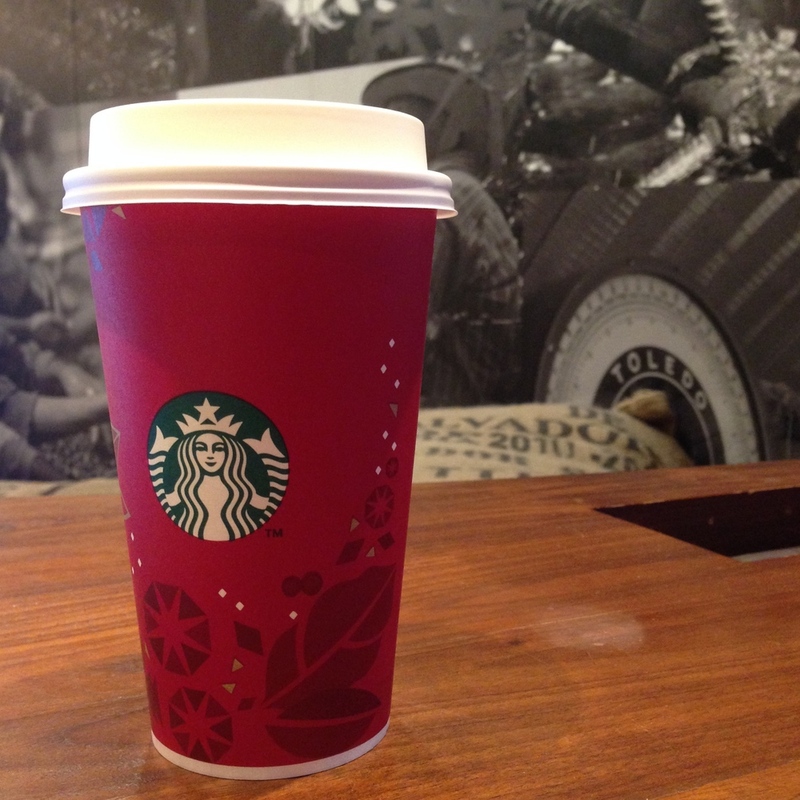 The little red cups of Starbucks are triumphantly announcing the beginning of Winter. The weather in Hong Kong isn't even cold, but I'm already ready to stay warm. With my first Toffeenut Latte of the season, here's to a wonderful Christmas season. May all of your coffee shop inspirations find ground, and may all your lattes be merry. In the fashion world, there are times when you are working frantically tirelessly endlessly, and then there are times when the waves of the seas are a little calmer. Thankfully this is one of those times. However it doesn't mean we're resting on our laurels, it only means there's time to work on side projects! Work hard, rest well, dream big.